While there is a common perception that overseas buyers have snapped up much of Metro Vancouver real estate, the number of homes owned purely by non-residents across the region is 4.9 per cent, according to a study of Statistics Canada data by Canada Mortgage and Housing Corporation (CMHC), published March 12. Including homes that are jointly owned by a mix of residents of Canada and non-residents – such as a satellite family where one spouse is resident in Canada, or a local student who jointly owns a home with their overseas parents – adds another 2.9 per cent. 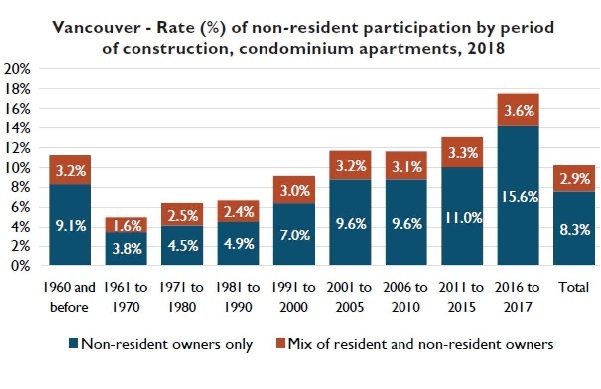 This brings the total proportion of Metro Vancouver homes with some “non-resident participation” to 7.6 per cent, said CMHC. However, the proportion of non-resident ownership varies dramatically when broken out by property type and by year of construction. Just 3.2 per cent of Metro Vancouver’s single-family homes were owned entirely by foreign nationals, while an additional 2.5 per cent of detached houses were jointly owned by a mix of residents and non-residents. This compares with condos, where 8.3 per cent were found to be owned entirely by overseas residents, and a further 2.9 per cent by a mix of Canadian residents and non-residents. 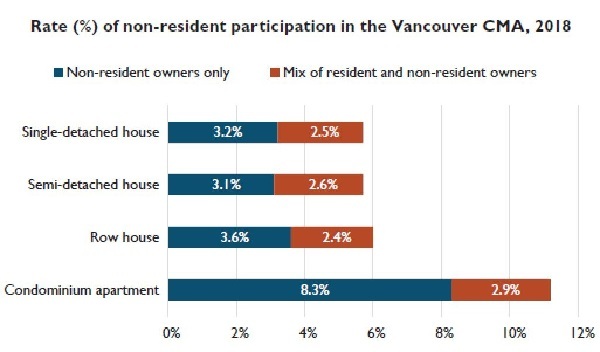 This brings the total share of Metro Vancouver condos with some “non-resident participation” to 11.2 per cent. The share of the region’s condos owned purely by overseas residents was found to increase dramatically among newer units, rising to a peak of 15.6 per cent in condos built in the frenzied 2016/2017 market. An additional 3.6 per cent of those 2016/17-constructed condos are jointly owned by a mix of Canadians and overseas nationals. This means slightly fewer than one in five Metro Vancouver condos built during this two-year market peak was purchased by at least one overseas buyer. CMHC found that the median value of homes owned by non-residents in Metro Vancouver and across B.C. was higher than the median value of homes owned by Canadian residents. The largest assessed value difference between non-resident and resident-owned detached houses is $1,580,000 (31.2 per cent) in the Metro Vancouver Electoral Area A, which includes UBC and the University Endowment Lands. Vancouver proper saw the second highest value difference, with the median non-resident-owned detached house valued at $1.1 million more than those owned by Canadian residents (22.3 per cent higher). The non-resident-owned median assessment value of a single-detached house in British Columbia was $236,000, or 36.7 per cent, higher than the median-valued resident-owned property in B.C.